« It’s the Pitt’s, Baby! 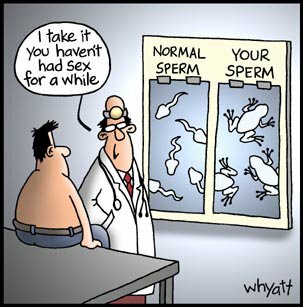 Here we have morphology issues explained by a simple cartoon. I think I will take this in to my RE so he can use it as a teaching tool. He can have a poster made up to use along with the plastic model of the male and female reproductive systems that sit jauntily on his desk next to the framed photo of his family. Well, here it is: the reason they tell the men to abstain. You want to let the numbers rise by abstaining for 2-3 days before giving an . . . errr . . sample . . . so that you get a good number of . . . err . . . well you know . . . BUT . . . not for too long and now we know why. This entry was posted on January 11, 2006 at 11:26 pm and is filed under Uncategorized. You can follow any responses to this entry through the RSS 2.0 feed. You can leave a response, or trackback from your own site.